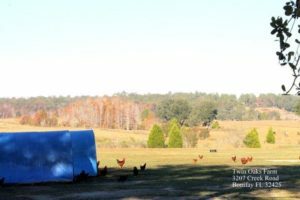 Twin Oaks Farm is a 94 acre certified organic farm located in Holmes County, Florida. We raise chickens and ducks for eggs and meat, the old fashioned way. They roam freely on pastures, and grass, bugs and sunshine are part of their diet. We supplement with a certified organic mix of real grains, NO soy, we are 100% soy free farm. We use movable coops where our chickens lay their eggs. At night we close the coops to keep them safe from predators, we also have a whole crew of donkeys patrolling the pastures. Our chickens share their pasture with the a herd of Gulf Coast Sheep and our signature Large Black Hogs: Cochon Noir de Bonifay. To complete our biodiversity, we also raise bees at our apiary. The farm produces a whole line of artisan food using only organic and/or local ingredients. Our production is small and authentic, the taste of Real Food.